Introducing the Republic of Latvia which can be described as a small, peaceful Baltic State with beautiful landscapes, located between Lithuania and Estonia, on the shore of the Baltic Sea. According to statistics, the population of Latvia is currently estimated at 1,92 million people (2018 census poll). The biggest ethnic groups are Latvian (62,2%) and Russian (~25,2%). The official language is Latvian, however, the majority of the population also speak Russian and English languages. Latvian nominal GDP per capita is estimated to be around 18 458 USD. In the year 2008 the Latvian economy suffered an economic crisis, however, now it has fully recovered. On the 1st January 2014 Latvia entered the Eurozone, and Euro was be introduced as the new national currency instead of Lat. Latvia is also a member state of the European Union and Schengen area, which provides many benefits for its residents. If visiting Latvia for a short term of up to 90 days – a simple visa is required. The population of Latvia dramatically decreased during the period from 2008 to 2010. During this period almost 200 000 people left Latvia in search of a better job or education. However, annually Latvia hosts several thousand immigrants. Immigration to Latvia is developing dramatically, with several thousand residence permits being requested every year. The Immigration Law of Latvia provides several options for those, who want to immigrate to Latvia. Many students are moving to Latvia in order to get a European education and discover new possibilities for living and travelling in Europe. Immigration services in Latvia are very well developed. Immigration to Latvia is a good option, if you wish to live, work and study and travel in Europe. There are many options provided by the Latvian Immigration Law in order to acquire a residence permit and move to Latvia, however, according to statistics, the most popular options are investment in a Latvian company, bank or real estate. If you want to know more about acquisition of residence permit in Latvia, you can read here: http://www.immigration-residency.eu/residence-permit-latvia/. There are several major pull factors for lawful immigration to Latvia. First, prices in Latvia are comparatively small. Second, there are many options that can be used to acquire a residence permit. Third, Latvia is a part of the Schengen area and the European Union. In order to visit Latvia, an immigrant needs to follow all the requirements set out by Latvian immigration law. There are several possibilities, depending on the purpose of your visit. You may need a work permit, visa or Schengen visa in order to visit Latvia. If you want to reside here – you need to acquire a residence permit. The grounds for issuing one of these documents are laid out in Immigration Law. The Latvian immigration Law is the main legal regulation for immigration to Latvia. It was drafted in year 2003 and since then it was dramatically modified. Immigration Law distinguishes two main groups of immigrants: those, who are citizens of the European Union or European Economic Area and those, from third states, who are considered non-EU citizens. The Immigration Law provides two different regulations for each group of immigrants. According to the Immigration statistics, provided by The State Land Service and The Office of Citizenship and Migration Affairs, several thousand foreigners have requested a residence permit in Latvia during the last year alone. 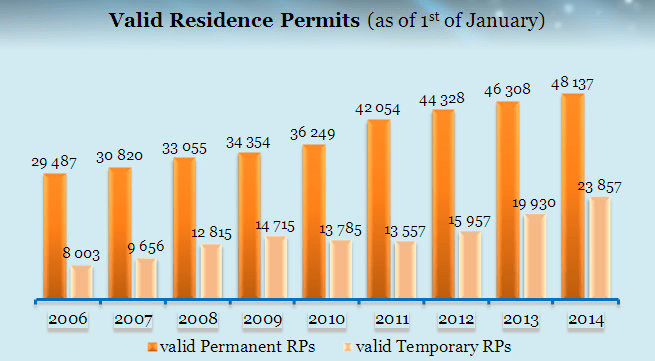 According to the same statistics, only 2,5% of residence permit applications were denied. The most popular city for immigrants is Riga. Since it is the biggest city in Latvia, it perfectly satisfies all the needs of a modern person. The other two big cities by population are Liepaja, on the shore of the Baltic Sea, and Daugavpils, in the heart of Latgale. Statistics show that the Riga real estate market makes up about half of the entire Latvian real estate market. The amount of sales of real estate in Riga is double that of all other parts of Latvia combined, which not only makes Riga real estate a valuable investment, but Riga itself – the most popular city in the country. Tourists mostly visit Riga with its fine architecture, museums, theatres and bars. However, such cities as Jurmala and Ventspils are also quite popular among tourists. Both of these are located by the Baltic Sea. Latvia is a member state of the Schengen area. Countries of the Schengen Agreement have abolished passport and immigration control at their common borders and for travel between their member states. Member countries also recognize Schengen visas issued by other Schengen states. On the outer border, or upon first entry to the Schengen area, normal immigration control procedures apply, however admission to any Schengen country is considered admission to the whole Schengen area (all member countries), with no further immigration checks needed. Third-country citizens holding unified Schengen visas may stay in any Schengen member state for 90 days. If you want to stay for a longer period of time – you need either a long term visa or a residence permit. Due to the strict immigration policies (due to a large amount of illegal immigrants), sometimes it may be quite hard to acquire a Schengen visa. Nevertheless, if you have positive visa history and enough funds to stay – then the process can be quite simple and painless. Short stay C type visa A short-stay visa which may be issued for one, two or multiple entries. Travel health insurance, documents on sufficient funds and proof of accommodation required. Long stay D type visa Foreigner who needs to stay in Latvia more than 90 days depending on the circumstances should apply for a long-stay visa. Travel health insurance, documents on sufficient funds, police clearance certificate, documents proving purpose of stay and proof of accommodation required. Visa with a limited territorial validity Such visa is not valid for entering all Schengen member states, but only those indicated on the visa. Travel health insurance, documents on sufficient funds and proof of accommodation required. There are three popular ways to obtain a residence permit (for 5 years with an opportunity of extension) in Latvia: investment in a Latvian company, bank or real estate. A Residence permit for education is also an option, but it is much harder to acquire and it cannot be extended to a permanent residence permit later. If you want to know more about the residence permit in Latvia, you can read more about it here: Acquire residence permit in Latvia..
Immigration history in Latvia is not great, which is seen by the small ethnic diversity in Latvia. The second largest ethnic group after Latvian (62,2%) – is Russian (25,2%). The majority of Latvia's Russian population immigrated to Latvia from Russia during the period of the Soviet Occupation (1945 – 1991). Since Latvia has entered the European Union in year 2004 and opened its borders due to the Schengen agreement, many locals have left Latvia pursuing opportunities in other EU states – primarily during the crisis 2008-2010. Currently, Latvia offers residency for foreign investors, who are non-EU citizens. 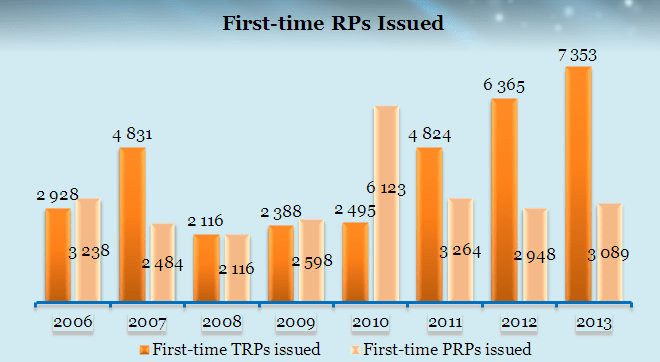 During the last year, almost 3000 foreign investors have requested a residence permit in Latvia. Immigration to Latvia for Indians is very well developed. This statement is backed up by the fact that in year 2018, 1130 Indian citizens have applied for a temporary residence permit for the first time. Obtaining a visa to Latvia for Indians works more or less the same as for most Schengen countries because Latvia is part of the Schengen Area. If you already have a valid Schengen visa then you can use this to travel to Latvia. Residence permit acquisition in Latvia provides a number of benefits. For example 1) right to employment 2) right to engage in a business activity 3) opportunity to travel across Schengen Area visa-free. We provide Indians with immigration and visa services in Latvia. There are various programs that we have available that can allow you to Live, Work and Study in Latvia – and even permanently move to Latvia and gain Latvian citizenship one day.